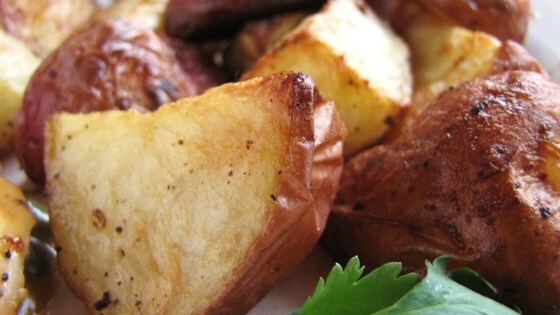 "These are roasted potatoes at their best - plain and simple. Red potatoes are tossed with olive oil, and salt and pepper, and then roasted to perfection." Adjust oven rack to lowest position and heat oven to 450 degrees. Toss potatoes with oil, salt and pepper. Arrange, cut side down, on a large lipped cookie sheet or jellyroll pan. Roast until tender and golden brown, about 30 minutes (check after 20 minutes). Transfer to a serving dish. Copyright 2004 USA WEEKEND and columnist Pam Anderson. All rights reserved. Quick and easy potato recipe. I just added some Italian seasoning and garlic powder to the mix and the potatoes turned out perfect. Instead of halving the potatoes I quartered them instead.